Two weeks after Walther Model took command of Army Group Center, Ivan Konev’s Soviet First Ukrainian Front struck his original command, Army Group North Ukraine, now led by Josef Harpe. Konev concentrated a great deal of force, including First Guards Tank Army re-deployed from the forces facing Romania, for a two-pronged offensive. The northern wing would be formed by the crack First Guards Tank Army led by the already-legendary M.E. Katukov. As Katukov broke through the German front near Rava-Russka, Cavalry-Mechanized Group Baranov, with one cavalry corps and one tank corps, would press through additional penetrations made by Third Guards Army with a mission of deep penetration. The southern wing, with Third Guards Tank Army and Fourth Tank Army, would attack south of Brody. Cavalry-Mechanized Group Sokolov, also with one cavalry and one tank corps, would follow 60th Army’s assault groups and seek to link up with Baranov’s group well to the west of Brody. The immediate objective would be the encirclement of the German XIII Corps on the old Brody-Dubno battlefield of 1941, and a further encirclement of German forces in and around the great Ukrainian city of L’vov. 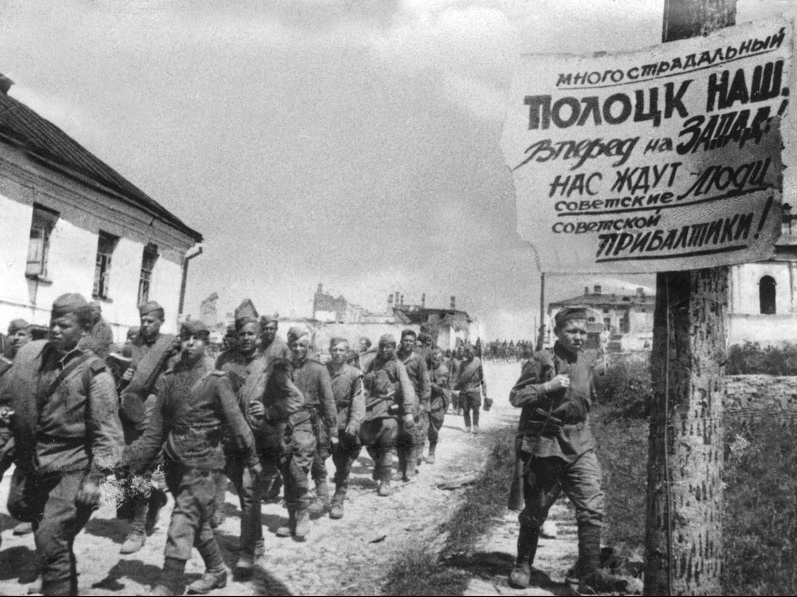 The Red Army enters Polotsk, 4 July 1944. The official conscription age of 18 was widely ignored. All told, Konev marshaled 1,578 tanks and 463 self-propelled guns in the assault formations, supported by 41 rifle divisions. Another 33 rifle divisions would hold the front lines behind them. Three Axis armies faced Konev: the German Fourth Panzer and First Armies and the First Hungarian Army. Between them they numbered 27 infantry divisions holding the line, with five infantry, fine panzer and one panzer grenadier divisions immediately behind them. Between them, the mobile divisions counted 800 tanks and 230 self-propelled guns, including 30 hopelessly outdated Hungarian-made vehicles of Second Hungarian Armored Division. Army Group North Ukraine had no meaningful operational reserves: six panzer divisions and two infantry divisions had shifted northward to try to contain the disaster enveloping Army Group Center. For once, the vaunted Soviet scouting and intelligence operations let Red Army commanders down; four of the panzer divisions still supporting Army Group North Ukraine had been incorrectly identified as having moved off to the north. The unexpected presence of enemy tank support would come as a nasty surprise to the assault formations. The offensive’s northern wing jumped off on 13 July 1944, with still more surprises for the Soviets – in many sectors, the German front-line positions were not manned. Harpe had authorized a withdrawal, and many of his division commanders apparently got a head start on the process. The recon companies quickly signaled for the follow-up forces to speed up their own advance, and Soviet troops and tanks poured into the gaps, to be met by the unexpected presence of 16th and 17th Panzer Divisions. Katukov feinted with his First Guards Tank Brigade – his former command – to draw the panzers away from his army’s main attacks, which allowed deep penetrations despite the presence of armored reserves. While Katukov’s sleight-of-hand produced results, the southern prong immediately ran into stout German defenses – here, the Axis had not begun their withdrawal and fought back with determination. Battle groups from 1st and 8th Panzer Divisions not only blunted the Soviet advance but in several places threw them back beyond their starting positions. Only at the seam between the German 349th and 357th Infantry Divisions did the attack make much progress, thanks to commitment of a tank and a motorized rifle brigade from Third Guards Tank Army to assist the infantry. On the next morning, Konev ordered 3rd Guards Tank Army to concentrate on that breach, and over 1,000 tanks and self-propelled guns poured through the German lines. German counter-attacks failed to seal the breakthrough, but did prevent the Soviets from widening it. The entire zone remained within range of German artillery fire. The Soviets responded by driving straight westward for L’vov while the northern wing turned southward. Within four days the Germans around Brody had been encircled. While Soviet rifle divisions with additional artillery moved in to squeeze the Brody pocket, the tank armies continued their westward surge. After a few half-hearted attempts at relief, Harpe wrote off the 45,000 men of XIII Corps trapped around Brody and ordered his armies to fall back. Resistance in the Brody Pocket collapsed on 22 July, and L’vov fell four days later. On Konev’s northern flank, Rokossovsky’s 1st Belorussian Front had replenished its supplies and its tanks. Rokossovsky’s troops had undertaken feint attacks on the 13th to draw the enemy’s eyes away from Konev’s front, and five days later they began an offensive for real. Eighth Guards Army, the Heroes of Stalingrad (as 62nd Army) and 47th Army led the attack, which struck at the seam of Army Group Center and Army Group North Ukraine. The rifle divisions quickly drove back the opposing German Ninth Army’s right flank and the left flank of Fourth Panzer Army, tearing a large gap in the Axis lines. Rokossovsky fed his newly-arrived Second Tank Army into the breach the next day along with Cavalry-Mechanized Group Kryukov. The Soviet mobile formations raced forward, with Konev’s tankers to the south matching their progress. On 22 July, Soviet troops captured the Majdanek concentration camp, the first such killing center to fall into Allied hands. The swift Soviet advance prevented the camp guards from carrying out their orders to destroy all evidence of their program of mass murder, and they only managed to inflict cosmetic damage on the crematoria. All else: facilities, documents, and several thousand would-be victims, fell intact into Soviet hands. The Soviets immediately spread word of their find, setting up a Soviet-Polish commission to investigate the crimes (estimates vary, but it appears that about 80,000 people were murdered in the camp, three-quarters of them Jewish). After removing the survivors for medical care, NKVD cadres took over the prison and held members of the Polish Home Army there. About 250 political prisoners of the Nazis were held by the NKVD and transported to Soviet prison camps. Lublin fell on the 24th, and by late July Soviet spearheads had reached the Vistula River and the outskirts of Warsaw, where German resistance stiffened and Soviet spearheads hit the end of their logistical tether. The Soviets seized bridgeheads across the big river, but the Germans managed to keep them contained. Rokossovsky inserted the fresh Polish First Army into the line, but even the exiles’ unauthorized enthusiasm for liberating Warsaw could not maintain the momentum. The degree of Soviet effort to liberate Warsaw would remain controversial for the next 75 years. The Polish Home Army rose against the Nazis on 1 August, and German reinforcements poured into the city to crush them while the Soviets did not advance. While the Soviets had limited offensive potential, they did not order the fresh troops of Zygmunt Berling’s First Polish Army forward nor did they allow the Western Allies use of Soviet-controlled airfields to re-supply the insurgents. If Stalin and his marshals did not intentionally leave Warsaw unrelieved, the outcome of Poles and Germans killing one another certainly served their long-term political purposes. The Germans undertook the systematic destruction of every building in the Polish capital, which did not fall to the Soviets until January 1945. With the Axis front thoroughly pulverized from Finland on south, the final blow fell on Army Group South Ukraine shielding Germany’s most important remaining ally, Romania. Germany had made a solemn undertaking to defend Romania, but the disasters to the north led to the re-deployment of five panzer and six infantry divisions to the central front, leaving the army group with two German panzer divisions (13th and 20th, the latter no more than a remnant of the division destroyed two months earlier), one motorized division (10th) and one brigade-sized Romanian armored division – many of whose vehicles were stolen by the Germans to replenish 20th Panzer. 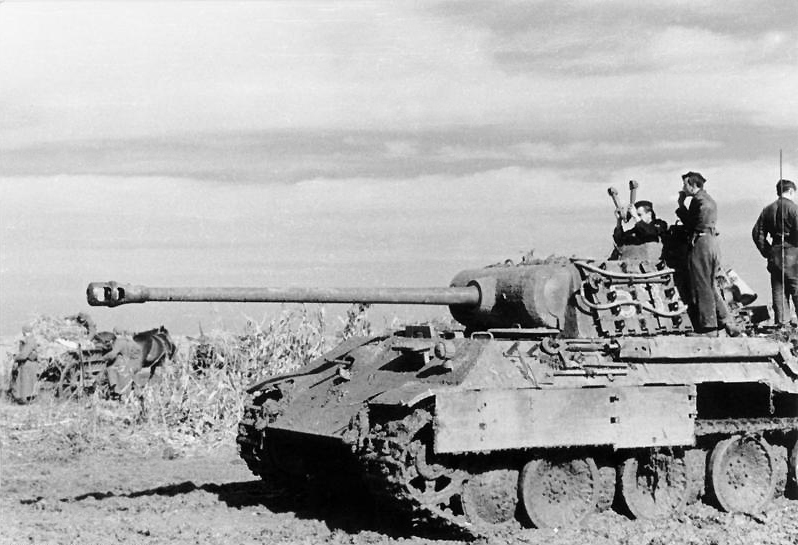 A German Panther tank in Romania, August 1944. A rare photo indeed. The Royal Romanian Army had done a great deal to recover its fighting strength, but while its front-line forces were numerous the best units – the divisions of the Mountain and Cavalry Corps – had been lost in Crimea in April. While many of their soldiers had been evacuated, they had fled without their heavy weapons and the divisions had not yet been reconstituted. Three armies guarded the Romanian frontier, with Fourth and Third Romanian Armies flanking the German Sixth Army between them. Each of these commanded a mixture of German and Romanian units. Rodion Malinovsky’s Second Ukrainian Front’s eight armies mustered 55 rifle and cavalry divisions including Sixth Tank Army and Cavalry-Mechanized Group Gorshkov, about 770,000 men and 1,200 tanks. The neighboring Third Ukrainian Front commanded by F.I. Tolbukhin had about 520,000 men in five armies with two independent mechanized corps in support. The Soviets held massive advantages in overall numbers as well as numbers of tanks and artillery pieces, and air support. All three armies - German, Romanian and Soviet - included a great many semi-trained recruits; some of the Soviet rifle divisions made up their ranks with thousands of “plunder Ukrainians” rounded up wholesale in liberated villages and incorporated directly into Red Army units with no training. And while many Romanian soldiers remained willing to put their lines on the line to defend their country, their upper leadership seethed with resentment at the apparent German abandonment of their commitment to defend Romania. Few Romanian generals remained willing to see their men slaughtered for the glory of Adolf Hitler. Both Malinovsky and Tolbukhin struck on the morning of 20 August, each concentrating their force on a narrow front. After a heavy artillery bombardment, Second Ukrainian Front struck Fourth Army’s 5th and 7th Romanian Infantry Divisions with an entire army swarming the front of each Romanian division. Fifth Infantry Division lost most of its front-line troops in the shelling, and the Soviets poured through both formations’ positions. At the same moment, First Ukrainian Front flung first a massive bombardment and then an entire army at each of the German 306th Infantry and Romanian 4th Mountain Divisions. While the mountain troops fought furiously to hold on, the Germans simply fled in mass and Soviet tanks roared through the resulting gap. By the 24th, the German Sixth Army had been surrounded and Romania sought an armistice with the Soviets. King Mihai oversaw a coup against dictator Ion Antonescu, and on the 25th Romania declared war on Germany. For the next few days, confusion reigned as Romanian troops fought both the Soviets and the Germans, and the Soviets continued to take Romanians prisoner who attempted to battle the Germans. Bulgaria declared itself neutral on the 26th; Soviet troops entered the country on 5 September and the kingdom declared war on Germany on the 9th. Romanian and Bulgarian armies then joined the Soviet advance north-westward into Hungary. While the Soviet offensives proved costly to the Red Army, with some 245,000 killed or missing and hundreds of thousands more wounded, the Germans and their allies lost some 900,000 killed or missing plus two of their allies switched sides. While hard fighting remained, the outcome of the war could no longer be in doubt and the only variable remained how long it would take to root the Nazis out of their final bunkers. 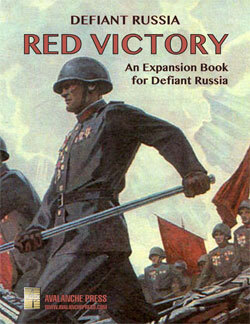 You can order Red Victory right here.